After a cold day on the slopes, pizza and beer are an obvious apres ski choice. But for those in search of fine dining in Vail, Colorado, look no further than Terra Bistro. It’s easy to be skeptical when one’s hotel recommends a restaurant, and you find that practically everyone in your hotel ends up with reservations. Hmm. There goes the unique find! But Terra Bistro in Vail is worth every recommendation. 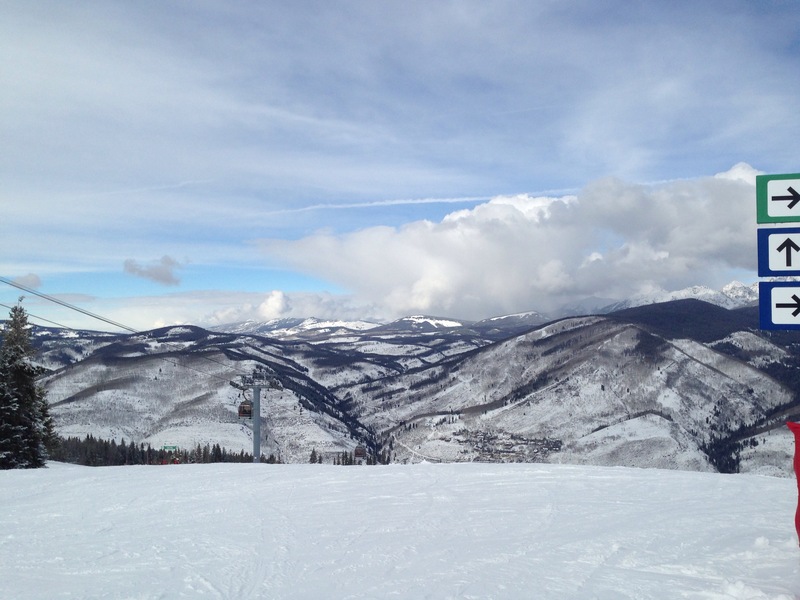 Great “new American” cuisine in Vail village instills confidence in ski resort fare. Terra Bistro markets itself as 90% organic, farm to table. The restaurant lacks the typical rustic mountain/ski chalet atmosphere. It feels more like a modern escape, a sleek, modern – if not urban – vibe. 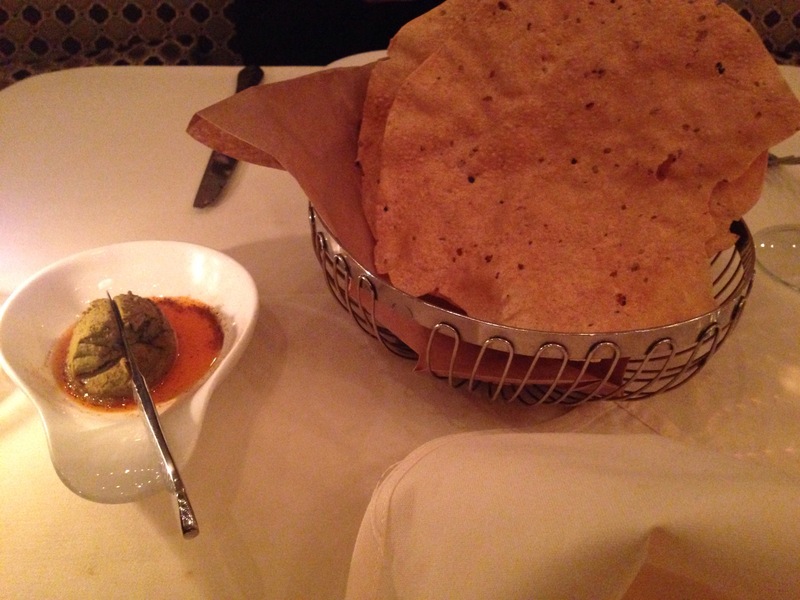 Pappadum – thin potato flour and pepper crisps, a staple rarely seen outside Indian restaurants – were a welcome departure from bread, paired with a lentil spread that resembled grey wasabi in appearance and texture but had a pleasant cumin scent. I started with the vitality salad (pictured in the featured photo, above), which features the restaurant’s own sprouted seed mix, goat cheese, cherries, and more. It was a great palate cleanser. The hangar steak was a solid bet. I requested it cooked to medium rare, and it was perfectly cooked and tender with a salty crust that the scant bleu cheese crumbles only enhanced. A cocoa-chipotle ketchup was not necessary, but with a hint of Worcestershire, it seemed a bit more A1 and less ketchup, far more suited for a poorer cut of steak. 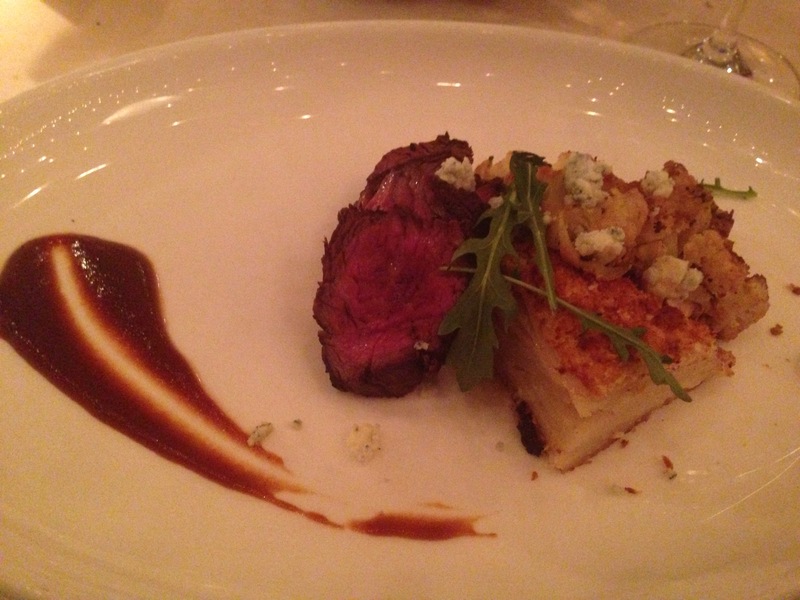 The steak was served with roast cauliflower and au gratin potatoes. The latter were not my grandmother’s au gratin – the cheese was ever so light, but the potatoes and cheese were baked to a wonderful level of caramelization. The resulting preparation was light and flavorful. Our friends donated their heaping side order of honey-lemon Brussels sprouts to a good cause (my stomach). While they were slightly overdressed with a sweet and tangy vinaigrette, the flavors were a nice departure from the salty Unami variety that is more prevalent. Sadly, we didn’t try one of their desserts, but I heard their chocolate stout cake was fabulous. When typically hearty ski fare just won’t cut it, taste the elegance of Vail Village’s Terra Bistro.